"Once you try these mini calzones, you may never go back to fixing the large ones again! These calzones come together in a snap, and are a great way to sneak a few veggies into your kid's diet. The best part is they are small so it makes it easy for little hands to pick up and eat. Plus they taste like pizza and there's even a dipping sauce!" In a medium bowl, stir together the ricotta cheese, Italian seasoning, salt, Parmesan cheese, mozzarella cheese, pepperoni, mushrooms, green pepper and onion. Set aside. Unroll the crescent roll dough and separate into 4 rectangles. Press the remaining perforations together to seal. Spread the filling evenly onto the rectangles. Roll up the filling inside the dough starting at the short side. Slice each finished roll into four slices, and place cut side down onto a baking sheet. Bake for 10 to 12 minutes in the preheated oven, until lightly browned. 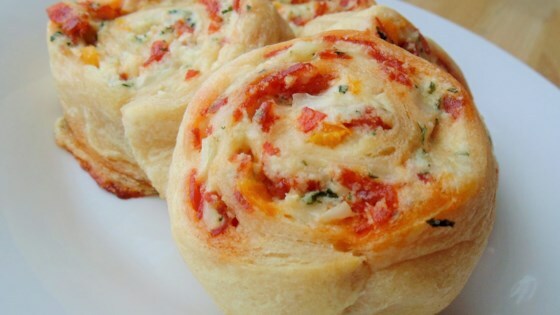 While the pinwheels are baking, warm the pizza sauce. Serve the pinwheels with pizza sauce in small cups for dipping. Quick pizza flavor for the whole family! Easy to make but they didn't blow me away. I would probably make them again. We really enjoyed this recipe! I think next time I'm going to saute the peppers and onions. I used the basic idea here and made mine with spinach instead of pepperoni. But they were delicous! Everything went fine in preparing as given. I really liked it better without the dipping sauce. It is a very good appetizer or party food. It was a bit too monotonous to be a main dish though.